What if the study of religion started with the African American experience? Instead of privileging a specific tradition, this course examines the history of a people who came to a new world compelled to quickly learn the significance of “religion” itself. We will follow along by plumbing the depths of the Trans-Atlantic Slave Trade, listening to songs born of the hush harbors, visiting the black gods of American metropolises, and witnessing the diversity of black church culture. By charting the development of this worldview, we will better understand religion’s role in the human condition. “Baptism,” image by Viqi French, used under Creative Commons. Paul O. Myhre, ed. Introduction to Religious Studies (Anselm Academic, 2009). An anthology of essays from scholars across the discipline. The volume introduces students to the various ways religion is studied by academicians. Charles H. Long, “Perspectives for the Study of Afro-American Religion in the United States,” History of Religions 11:1 (August 1971), 54-66. A foundational article outlining a way to consider the concept “religion” in light of the experience of African Americans. Would you know religion if you saw it? The Fall 2014 class put this to the test. Students went on a digital scavenger hunt around the Elizabethtown College campus to find images of religion as defined by various religious studies scholars. 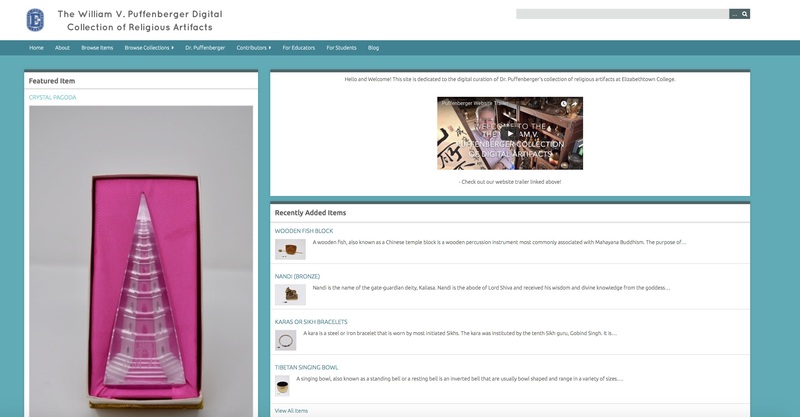 We submitted our findings to Sacred Matters’ “Show us Your Sacred” Photo Contest. Students also studied the scholarship of Culture on the Edge, an international group religious studies theorists. They devoted particular attention to Dr. Monica Miller’s work on religion and hip hop culture. For their final exam, the class developed their own theories of religion and shared their findings with Dr. Miller via Skype. Learn more about Culture on the Edge and the event here. In Spring 2015, Elizabethtown College hosted two art exhibits that served as the perfect lab for our study. The Art for Justice exhibit featured art from artists conveying their experience in prison, rich paintings that showed fascinating interpretations of Christianity, Islam, and rhetorics of freedom. Relatedly, my Etown colleague, Dr. Rita Shah, produced a photo exhibit called “Prison or Slave Castle” which challenged students to consider the politics of discipline, an area where religion has been found especially effective. Both exhibits offered a fruitful sight to test and apply some of the theories we had been playing with in the course. Dr. Shah uses her photography exhibit to compare slave castles in Africa with American prisons. As racial tensions have risen in the public consciousness, the Spring 2015 class made a concerted effort to think about how #BlackLivesMatter. Our inaugural class session hosted a forum called “Beatdowns and Downbeats: America as a Hip Hop Nation.” This was part of Elizabethtown College’s #EtownEngage Teach-In, a campus-wide event in response to the current epidemic of radicalized violence. At the end of the semester, students used signifying theory to analyze student feedback during #EtownEngage to assess how #BlackLivesMatter @EtownCollege. For their final exam, the class presented their findings to students, faculty, and staff. 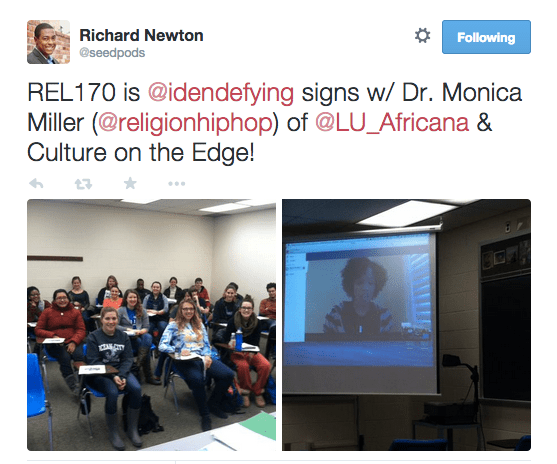 How Do Black Lives Matter at Elizabethtown College? When students at Elizabethtown College experienced an anonymous act of racism on campus this fall, they were not sure how to respond. But it was clear, students wanted to have a discussion about identity on campus. Student, staff, faculty, and administrators used Michele Norris’s The Race Card Project to launch just a conversation. Students were invited to tell their story in six words, to name the way they identify, want to be identified, and/or don’t want to be identified. For the final exam, students used the 500+ six-word stories and other data to examine the identity politics at play at Elizabethtown College. The Six-Word Story Listening Fair featured a poster session where they shared their findings. You can also read more about the pedagogy behind this course over at Practicum: Critical Theory, Religion and Pedagogy’s Syllabus Project. On the heels of the previous semester, this iteration focused on the concept of story in religion. Historian of American Religion, Dr. Kelly J. Baker, visited our class to share her insights about the tragic shooting in Charleston and the complexities of church homes. Her writing gave us a forum for thinking about the politics of place. We built upon this by inviting artist Robert Knight to speak with us about the aesthetics of religion. He was so kind as to screen his film, In God’s House: The Religious Landscape of Utica, NY. Our class ended with a turn back to the Six-Word Story Project. This time, students used basic ethnographic skills to interview two of their fellow students, inquiring about the story behind the story. They then leveraged critical theory to address the research question, “How does race or at Elizabethtown College.” We ended the semester with story-sharing tables where my students led discussions on their findings with staff, faculty, and administrators. How Does Race Work at Elizabethtown College? Continuing on the work of the Six-Word Story Project, my students practiced their ethnography skills by recording people’s thoughts on “the next six words on inclusive excellence” at Elizabethtown College. The idea was to use that prompt as a way to surface complexities about the community’s assumed values, particularly diversity and inclusivity. Michele Norris, award-winning founder of the The Race Card Project, recognized the student’s efforts in her visit as the 2016/7 Leffler Lecturer. Campus Members Weigh in on the next six words toward Etown College’s Word in Inclusive Excellence. For the final exam, students shifted gears and wrote essays in conversation with the upcoming volume Fabricating Identities, edited by Russell McCutcheon. They read essays by Culture on the Edge members, Russell McCutcheon and Vaia Touna, along with Richard Newton’s contribution. They then applied these ideas and what they had learned in class to theorize about how identity is signified through discourses familiar to those in religious studies. We ended the class with a seminar discussion. In the final offering of the course at Elizabethtown College, the presentation went back to the very basics of what we mean by “religion” as exemplified in African American history and culture. For the final, the class created a pop-up exhibit to teach what they had learned. Students were charged with studying religion as a particular discourse (i.e. violence, social activism, truth-claims), teaching audiences through (1) a 3D printed object emblematic of their thesis, (2) an image from a digital archive related to African American history and culture, and (3) an image from the nearby Lancaster African American heritage tour. The exhibit popped up in the College’s Scholarship and Creative Arts Day, MLK Day activities, Social Justice Week activities, and Black History Month. You can learn more about the exhibit in an episode of The Outgrowth.